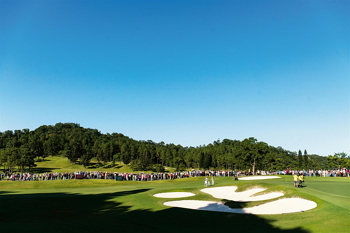 Under clear autumn skies, the romantic colorful arch at the entrance to the Ta Shee Golf and Country Club in Tao­yuan’s Daxi District welcomed competitors and fans at the Swinging Skirts LPGA Taiwan Championship. 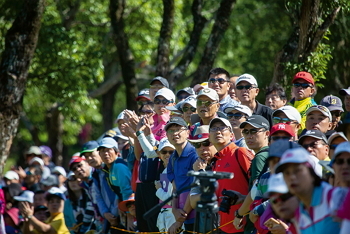 Broadcast in 170 countries, the event attracted more than 56,000 fans over four days at Ta Shee, setting a new record for spectators at a golf tournament in Taiwan. The fans’ passion and support and the outstanding perform­ances of top competitors made the international community take note of Taiwan’s golfing prowess. When the golfers swung their clubs, Taiwan’s fans gave them their undivided attention, both following the flight of the ball and showing proper gallery etiquette. The tournament left people with happy memories for several reasons. First and foremost was the strong field of top golfers. Competing for US$2.2 million, the tournament’s 81 competitors included five ranked in the world’s top ten and 11 in the top 20. Next was the weather: From 2011, when Swinging Skirts first began sponsoring this LPGA event, rainy and windy weather accompanied the tournament seven years in a row. One year, the outer edge of a ­typhoon even brushed by Taiwan. This was the first year the weather was good on all four days. It was a historically unprecedented instance of God smiling on the tournament. 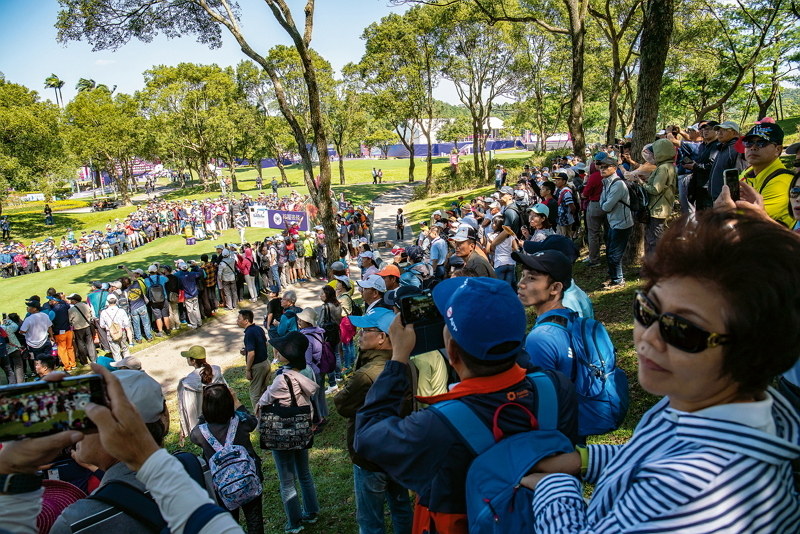 In particular, on the last day of the competition, the 32,496 in attendance established a new record for spectators at a golf tournament in Taiwan. 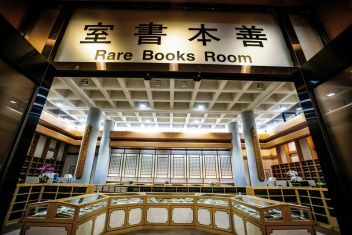 For many who traveled from central and southern Taiwan, it was the second time they had visited Ta Shee. The first time was when they came to see Tiger Woods compete at the Johnnie Walker Classic in 1999, which set the previous record for crowds at a golf tournament in Taiwan, when some 10,000 fans showed up on the last day of that event. When Taiwan’s own Hsu Wei-ling stormed onto the leader­board after her Round 3 performance, fans were delighted. On the first day of the tournament, she had ­garnered a passionate ovation when she eagled the long and difficult sixth hole of the course. On the third day, she got penalized one stroke when she hit water on the 16th hole, which has a sand trap on the right and a water obs­tacle on the left. Immediately afterward, she sank a miracu­lous 20-meter putt to make par and protect her posi­tion on the leader­board. That brought both a fist pump from Hsu and earthshaking applause from the gallery. Nelly Korda showed off elite golfing skills to win her first LPGA title. Nelly Korda battled with Hsu in the same group during the fourth round and felt the pressure from the tremendous support spectators were giving Hsu. But Korda was able to birdie on the fourth hole, which features a dangerous water hazard to the front right side of the green. That pulled her even with Hsu. Then on the par-five sixth hole, she was able to get to the green on her second stroke and once again hit a long putt for an eagle. At that point, she pulled ahead for good. Dubbed the “long-legged hottie” by golf fans in Taiwan, Korda turned pro in 2016 before formally joining the LPGA in 2017. She has played in 42 LPGA tour events. 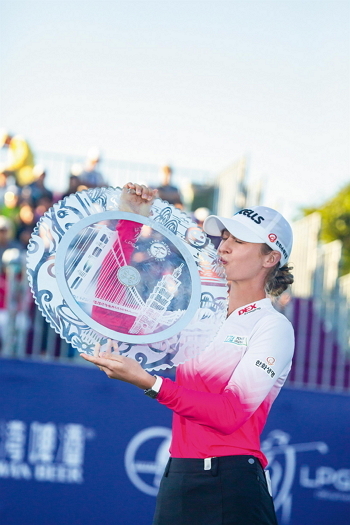 With a 13-under-par 275, Korda won her first LPGA victory in Taiwan, earning US$330,000. Apart from Hsu and Korda, the stars that golf fans could follow on the course included Sung Hyun Park and So Yeon Ryu, ranked No. 1 and No. 3 globally, as well as Brooke M. Henderson, who was then ranked second for LPGA earnings. To be able to see big names that one could usually only see on TV was well worth the price of admission. Competition on the LPGA tour is particularly fierce. The 33 LPGA-sanctioned tournaments in 2018 yielded 26 different champions. With such a crowded field of competitive golfers only Sung Hyun Park and Thailand’s Mo­riya Ju­ta­nu­garn were able to win three titles. And only Henderson, who is from Canada, and Japan’s Nasa Hata­oka were able to win two championships each. That is a demonstration of the women’s tour’s depth: However well the queens of the links are playing at the moment, there are many strong competitors just below them who are aiming to knock them off their thrones. 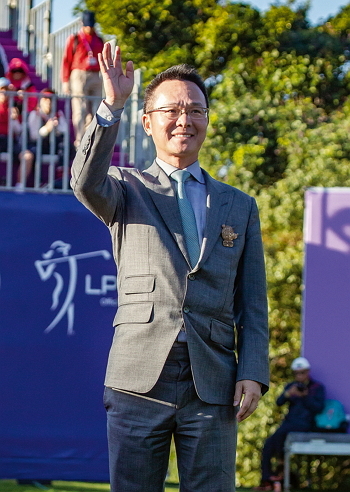 Johnson Wang, chairman of the Swinging Skirts Golf Foundation, has long been promoting golf and golf tournaments in Taiwan. His efforts have earned international acclaim. 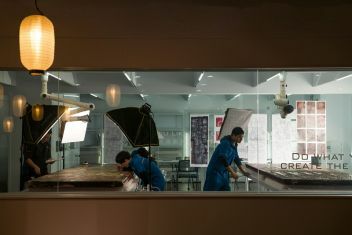 But the fans weren’t going to forgo opportunities to chase the stars and get autographs. World champion Park, who has an attractive androgynous look, proved to be a friendly star by signing quite a few signatures after her rounds. Lydia Ko, a Korean New Zealander who is a former teenage prodigy, is another favorite among Taiwan’s fans, who can recite her strengths as if enumerating family treasures. Each time she made a good shot, the crowds would erupt with applause, and Ko would reward them with a bright smile. And whenever a Taiwanese golfer sunk a tough putt or made a birdie, the local fans would break out in cheers and applause—whether for Taiwan’s “first sister of golf” Teresa Lu, the “smile queen” Yani ­Tseng, current Japan-resident Tsai Pei-ying, up-and-coming stars Vivian Hou and Lu Hsin-yu, or even Wu Chia-yen, an amateur who was Taiwan’s youngest competitor. All were on the lists of stars to follow. In addition to 62 LPGA pros, the field of 81 com­petitors also included 15 selected by the Taiwan Ladies Professional Golf Association, as well as four invited by corporate sponsors. The opportunity to participate in this international competition provided local com­petitors with a chance to observe the golfing skills and psychological make-up of top global players. It helped to broaden their horizons. With the LPGA tournament broadcast in more than 170 nations, Taiwan’s golfers had an opportunity to demonstrate their prowess in the global arena. 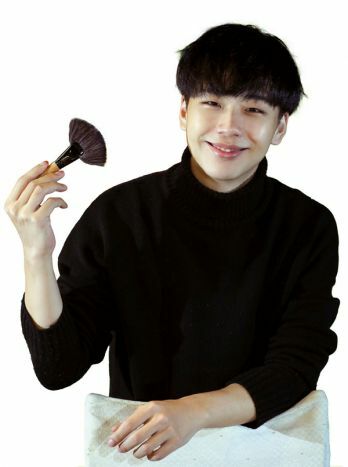 The top competitors at the events, through their tweets and Insta­gram messages to their fans, helped to promote Taiwan. The Swinging Skirts LPGA Taiwan Championship has showcased Taiwan to the world.